Table located in the main room. $100 deposit required. Large table located in the main room. $200 deposit required. Prime Table located on the Dance Floor. $300 deposit required. Thanks to you! Gracias a usted! Our social media familia is now 90,000 strong and we think it’s time for a toast. We’re giving the first 300 guests to enter the Conga Room this Friday, September 23rd, a complimentary glass of champagne, courtesy of our friends at Avissi, as a thank you for being one of our loyal followers, and a part of our social media familia. 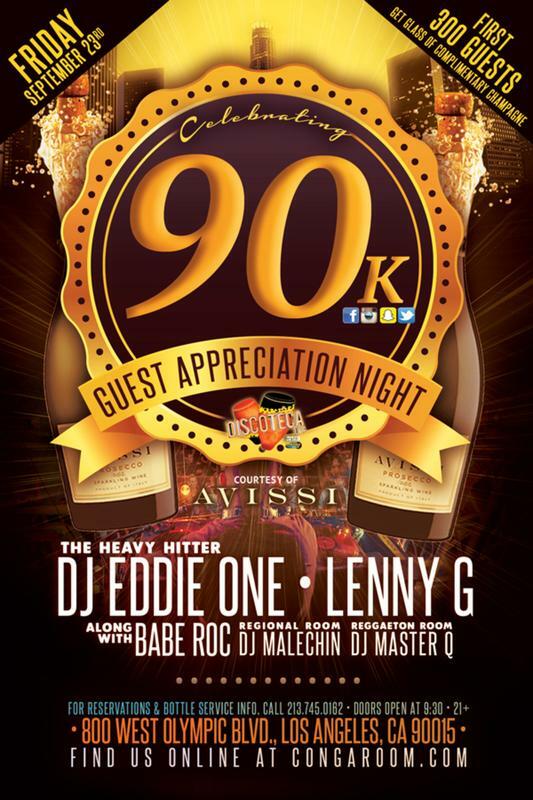 Friday, September, 23, 2016, the Conga Room presents DJ's Eddie One, Lenny G., Babe Roc, Malechin & Master Q. Bottle service is highly recommended. Doors open at 9:30pm. 21 & over with valid identification. 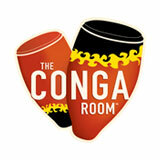 Join the party every week at the world famous Conga Room, the exclusive celebrity-owned nightclub in downtown Los Angeles, located at LA Live. 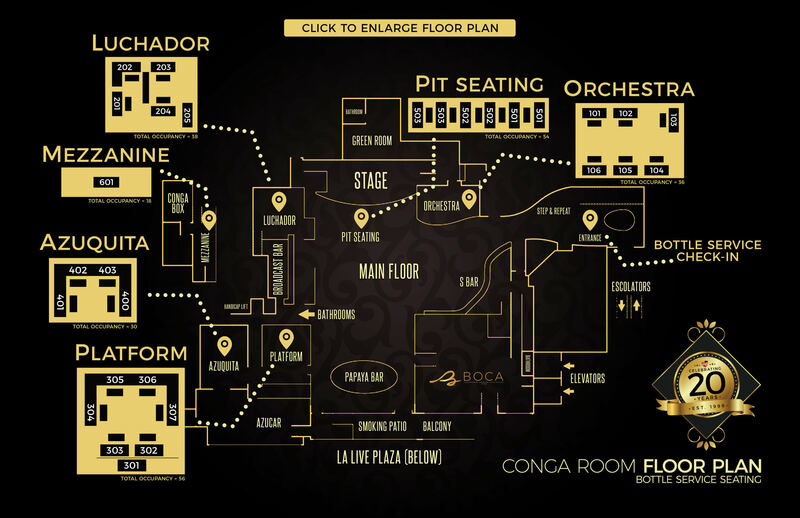 Conga Room boasts 3 rooms to keep you dancing all night long. Main room features tropical music such as Salsa, Latin Hits, Merengue and Bachata in addition to Spanish Rock. Our two additional rooms include the Havana Room, which plays all the Reggaeton hits, and our Barcelona Room, where you'll find all the best "regional music" such as Banda, Corridos and Nortenas. Conga Room also offers 3 fully stocked bars, plush VIP seating areas, an elevated DJ booth, an acoustically engineered ceiling and breathtaking panoramic views of Staples Center and LA Live. For the latest news and club info, don't forget to like our club page at: https://www.facebook.com/congaroom/. Conga Room management assumes final discretion.